How can you not love Herb Trimpe, the artist whose last name rhymes with Blimpie? I’ve known him since I was 15 years old, when I first started working at the famous Marvel Comics Bullpen, and was a big fan of his way before then. The Bullpen was truly star studded with my childhood heroes, and several of them even looked like Hollywood stars — Herb looked a lot like Alan Alda, John Romita Sr. looked like Gene Kelly, and Gene Colan always said Stan Lee looked like Jack Lemmon. There’s very little I can say about Herb’s work that wasn’t already said far more eloquently by Michael Chabon in his brilliant essay about Herb. (If you didn’t read this essay, it was on Chabon’s website for just a limited time, I’m hopeful that if it hasn’t already been collected in a book, that it soon will be). For me, Herb was the artist on The Incredible Hulk when I was still buying Marvel comic books off the newsstands in the Bronx. I remember he followed Marie Severin, and at first I was taken aback by how differently he drew Ol’ Greenskin, but as more issues continued to be published, and especially when Marie’s brother, John Severin, started inking Herb’s pencils, I was completely won over. Being a small part of the Marvel Bullpen was literally a dream come true for me, and I wouldn’t trade that experience for anything. Unfortunately, the downside of having so many surrogate fathers (in addition to a wonderful real father), is the pain that comes in losing them. Back in the ’90s, many fans were surprised to see Herb’s style change, as he tried to emulate the “Image Comics” look. I can’t say I was too surprised because the style everyone thought was Herb’s “real” style was Herb trying to be Jack Kirby. (Probably the closest he ever came was when he penciled a Fantastic Four Big Little Book, which was inked by his friend John Verpoorten). Oddly enough, what Herb considered his real style was much closer to the work of another prolific cartoonist also named Jack — Jack Davis. Check out the stories Herb did for Spoof or Argh!! to see what that style was like. Herb was an amazing guy in many ways. 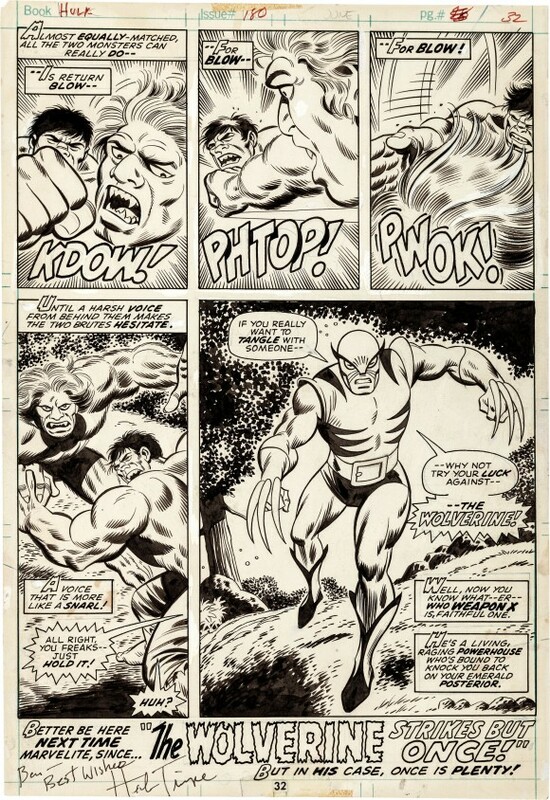 Perhaps you read recently that the Incredible Hulk page Herb drew that featured the very first appearance of Wolverine was finally found. Herb had given it away to a fan. 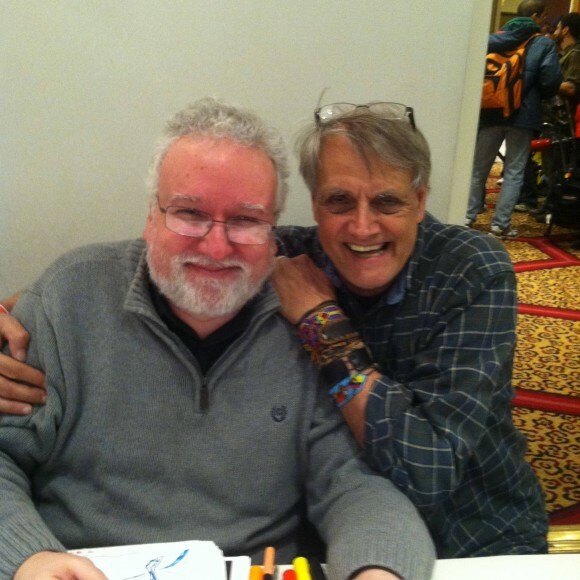 That’s typical Herb Trimpe! The fan who got the page had it auctioned off — it sold for over $660,000. The fan, who wishes to remain anonymous, donated a portion of that money to the Hero Initiative, a charity that helps comics professionals in need of assistance. Think about that — Herb literally gave away a page of his artwork, worth over half a million dollars, to a fan. Of course, he didn’t really know it would be worth that much someday, but still–! It was also heartbreaking when Marvel let Herb go, because they didn’t have work for him. I simply can’t ever imagine such a thing being possible. Not being able to create a successful series for someone who has contributed so much to Marvel’s success was a huge creative failure on Marvel’s part, in my opinion. But Herb was able to re-invent himself as a teacher, and was able to continue working. After retiring from teaching, Herb was able to return to comics by appearing at conventions, taking commissions, etc. 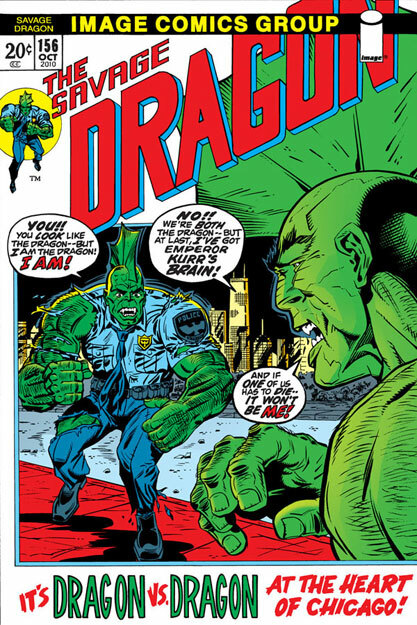 He even did some comics work again, most recently, in a special issue of Erik Larsen’s Savage Dragon. Herb worked on two stories — one that he penciled and Erik inked, and the other penciled by Erik and inked by Herb. The ultimate irony—the man who once thought he had to draw in an Image style to survive at Marvel, was working for Image, in his traditional Marvel style. I just saw Herb at the East Coast Comicon this past weekend. He was as friendly and as wonderful as ever. I’m so thankful that I was lucky enough to meet one of my heroes, and to consider him a friend. Rest in peace, Herb. I miss you already. I remember reading Herb Trimpe’s NY times article (maybe 15 years ago?) about being fired by Marvel and what I took from it was his willingness to keep doing the next right thing, despite the huge challenges facing him. And that he eventually found a different path that worked for him. Well put Jim. I’m so very happy we got the chance to spend this past weekend, the last weekend of Herb’s life with him. I broke down in tears yesterday when I heard the news, as I am writing this now, thinking about just as I was leaving the building to go home after a fantastic show, Herb called to me and he came over and gave me the biggest hug. Then we parted ways. I wish I had the chance to give everyone I loved a goodbye like that.